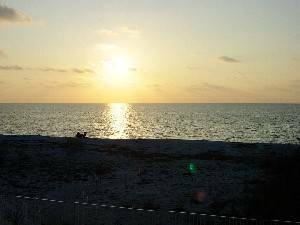 Our Luxury Condo is 50 Ft from the sand of Indian Rocks Beach, featuring a private pool,elevator,spa,a spectacular view from a 12 foot patio door on large 10 by 14 balcony.This could be a perfect place for you, to have the holiday of your life. WE HAVE ALLERGIES so it is VERY Clean and has had no pets. ALSO note the comments from our renters. Our condo my be a lower cost,but we have it continually rented. WE HAVE WI Fi, High Speed and a baby playpen. The large walk in closet can act as an extra bedroom for a little one. 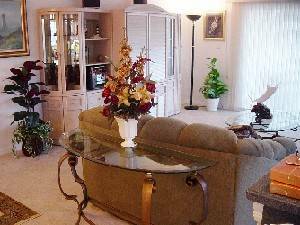 Our condo is just 3 miles south of Clearwater and 1 mile south or the beautiful home of many movie stars, in Belaire located 1 mile north on our road. When you walk north on our quiet beach, you may see him with some of his friends, although our beach is not very busy and the walk could end up being with just with you and your sweetheart. Nearby is great shopping, inexpensive restaurants, friendly churches (Indian Rocks Baptist, where over 5,000 meet each Sunday) and beautiful golf courses. From St. Peat /Clearwater Airport it is a 15 minute taxi drive and from Tampa it is 35 minutes. The shuttle is 29 and you will arrive at the beach in 50 minutes. 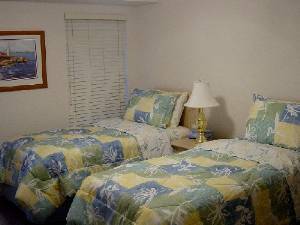 This Beach front condo has everything you will need for a great holiday, two 38 “ TV, DVD, stereo, 2 bedrooms,the master has a 4 Poster KING bed and the Guest a single King also. Each has a private washroom. The large living room has 2 large sofas, entertainment center, a glass dining table, very exquisite furnishings and art, extra phone outlets for computer and a kitchen that has everything. 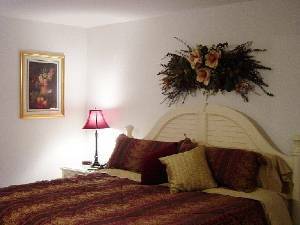 We have all the instructions in our home to make your vacation perfect and relaxing. 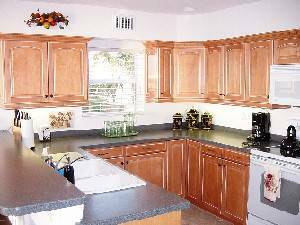 When you are finished a cleaning team will make sure our home is perfect for the next family. Disney, EPCOT, Cypress Gardens are just 1.30 minutes away and we usually drive there and back the same day. Bush Gardens is in Tampa 30 minutes away. 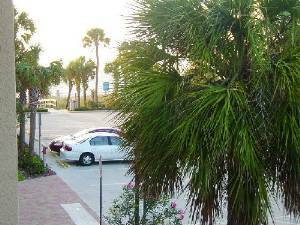 The beach is only 10 feet from the pool, only 70 feet from your door, and from your 10’ by 14’, balcony. If you need 2 condos together,please let us know. Condo 2, on our site, faces the Ocean and costs more per week. we hope you have a great holiday where ever you choose to go. You can sit by the pool,on the beach or relax on the balcony for great evenings. Our modern kitchen has all the latest gadgets. Antiques,2 sofas,large patio window.38" TV with DVD and stereo..Relax and enjoy. We have been pleased with everything here for the several years we have come to Indian Rocks. 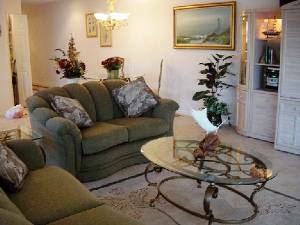 The condo is always sparkling clean and supplied with all the requirements for a relaxing enjoyable holiday. The beach is beautiful and handy and the sunsets from the spacious balcony are spectacular. 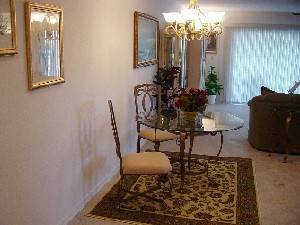 The location is also quite but close to many restaurants and required commerce. Kudos to the owners for maintaining this luxurious unit. Truly paradise! We have enjoyed spending the coldest month here in your luxurious condo on the beach. This is THE place to decompress! Everything you need is here...a well-stocked kitchen, comfortable king sized bed, twin bed for guests, two new lazy-boy leather sofas, super-clean condo, no one above nor below us, a heated pool even on chillier days, a clean hot tub, and friendly guests. When lounging by the pool, the view and sounds of the gulf waters and white sandy beach relax and soothe you. At sunset, the show of the setting sun offers a unique display each evening. We leave today.Your condo is fantastic.We are using your high speed internet to say thanks. We have 3 children and had our youngest Narhan 5 use the large walk in closet as his personal room. He loved it. We stayed here. What a place. Lots of room and a large balcony for the kids and a secluded parking lot for them to play in. We lived in luxury for 2 weeks. The beach is awesome and the pool great. The beach is at the door.